Mathematic stands forth as that which unites, mediates between Man and Nature, Inner and Outer world, Thought and Perception, [as no other subject does]. In Die Erziehung der Menschheit (1826). Adapted and translated in William Henry Herford, 'The School: Mathematic', The Student’s Froebel (1894), Vol. 1, 84. Mathematical analysis is as extensive as nature itself; it defines all perceptible relations, measures times, spaces, forces, temperatures; this difficult science is formed slowly, but it preserves every principle which it has once acquired; it grows and strengthens itself incessantly in the midst of the many variations and errors of the human mind. 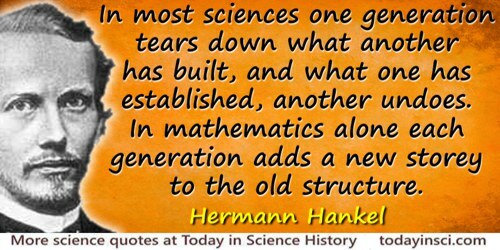 Mathematical science is in my opinion an indivisible whole, an organism whose vitality is conditioned upon the connection of its parts. For with all the variety of mathematical knowledge, we are still clearly conscious of the similarity of the logical devices, the relationship of the ideas in mathematics as a whole and the numerous analogies in its different departments. In 'Mathematical Problems', Bulletin American Mathematical Society, 8, 478. Mathematicians assume the right to choose, within the limits of logical contradiction, what path they please in reaching their results. In A Letter to American Teachers of History (1910), Introduction, v.
The mathematics have always been the implacable enemies of scientific romances. In Oeuvres (1866), t. 3, 498. There is no study in the world which brings into more harmonious action all the faculties of the mind than [mathematics], … or, like this, seems to raise them, by successive steps of initiation, to higher and higher states of conscious intellectual being. In Presidential Address to British Association (19 Aug 1869), 'A Plea for the Mathematician', published in Nature (6 Jan 1870), 1, 261. [Mathematics] is that [subject] which knows nothing of observation, nothing of experiment, nothing of induction, nothing of causation. In 'The Scientific Aspects of Positivism', Fortnightly Review (1898) in Lay Sermons, Addresses and Reviews, (1872), 169. … what is physical is subject to the laws of mathematics, and what is spiritual to the laws of God, and the laws of mathematics are but the expression of the thoughts of God. In 'The Uses of Mathesis', Bibliotheca Sacra, 32, 523.